Bethesda Rehabilitation Programs offer comprehensive swallowing therapy services for inpatients and outpatients upon physician referral. 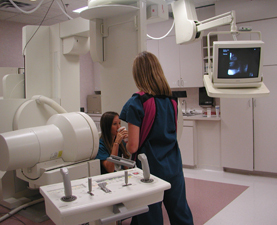 Outpatient swallowing therapy usually begins with an instrumental examination in radiology, called a videofluoroscopic swallowing study, a procedure that allows observation of the swallowing process as patients take in different consistencies of solids and liquids mixed with barium. If safe swallowing is possible, a regular or modified diet is selected. Recommendations may include changes in food consistency, body or head position adjustments, bite size or feeding rate changes, swallowing maneuvers, therapeutic strategies or a combination of these practices. If swallowing therapy intervention is warranted, a clinical swallow evaluation and subsequent therapy can be completed at both our Plaza and Health City locations. A swallowing evaluation team consists of a speech-language pathologist with specific dysphagia management experience and a radiologist for videofluoroscopic swallowing studies. Both the patient and referring physician are included in the process. Coughing? Choking? Wet, gurgly voice? For more information about Bethesda's Swallowing Rehabilitation Program, call 561-292-4960.